Blizzard recently unveiled what appears to be the all the rest of the cards in the Whispers of the Old Gods expansion last week. In the last post, I reviewed the class cards. 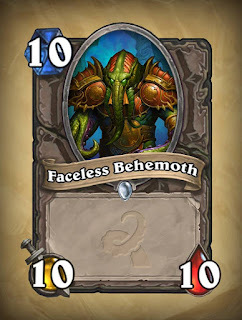 This post will look at the remaining neutral cards, and will therefore constitute the remainder of the expansion content. Here are the remaining cards that cost 1 mana in the expansion. 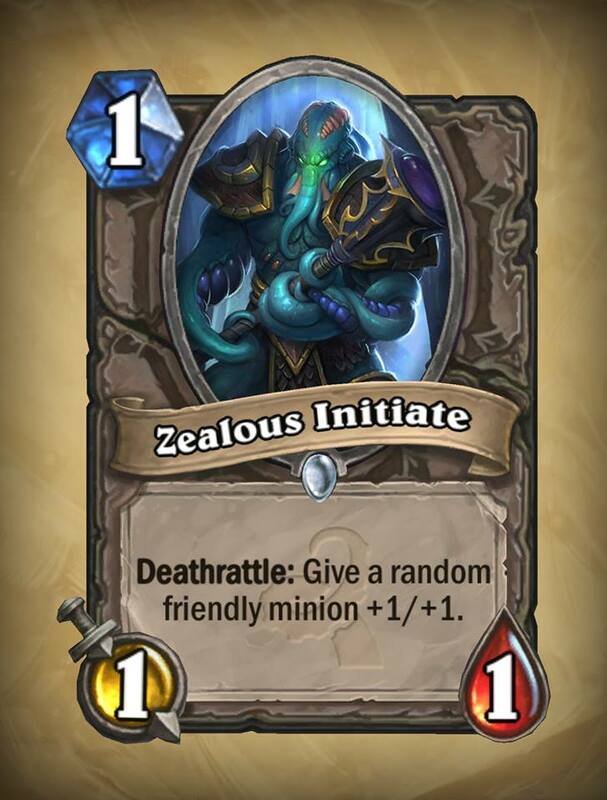 The Zealous Initiate is a low-cost Faceless minion with a decent deathrattle. The downside to the deathrattle is that it is attached to a 1/1 body, making it altogether too easy to ping this minion with Hero Power or a cheap spell before you can buff another minion with the deathrattle effect, although the tempo gain of the other player using Hero Power early or any kind of removal on this minion may make it worth it. A divine shield paladin deck or druid buff deck might make this card work, as might a Hobgoblin deck in Wild format. There are just too many better 1 drops out there. 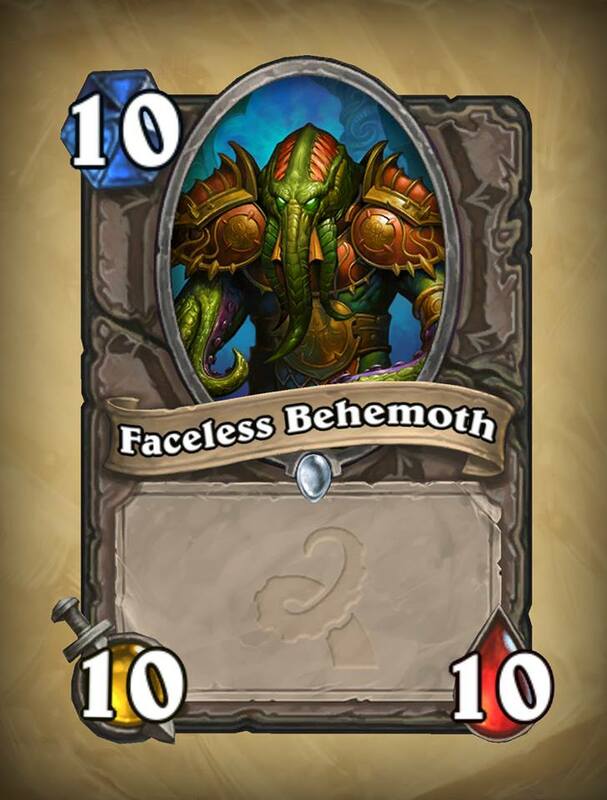 The deathrattle buff keeps it from being Terrible. Here are the remaining cards that cost 2 mana in the expansion. It must have been the salmon mousse. Twilight is the best time for geomancy. Now with more - ah, forget it. 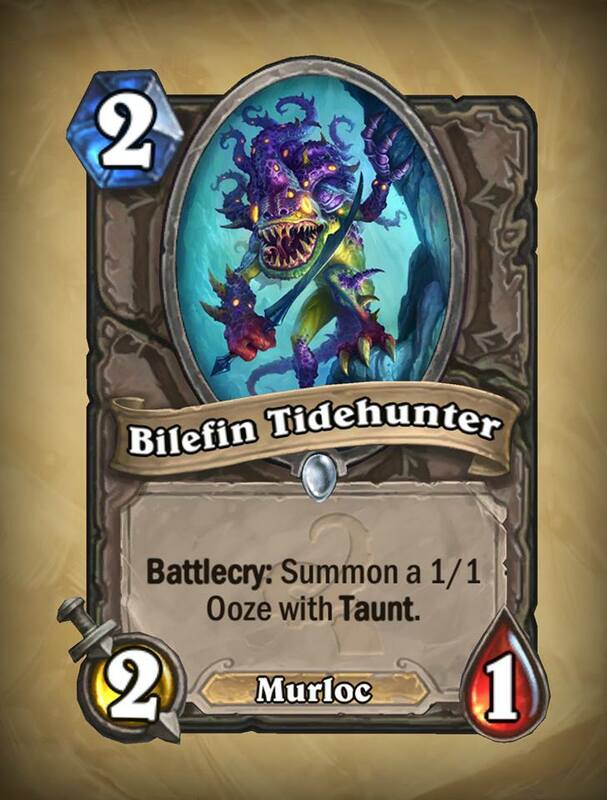 The Bilefin Tidehunter is a variant of the Murloc Tidehunter, summoning a 1/1 Ooze with Taunt instead of a 1/1 Murloc. You get Taunt in exchange for losing Murloc synergy, both cards work well with Knife Juggler, and both cards (and their summons) die really easily to board clears, tokens, or ping effects. It's potato-potahto as far as I'm concerned. 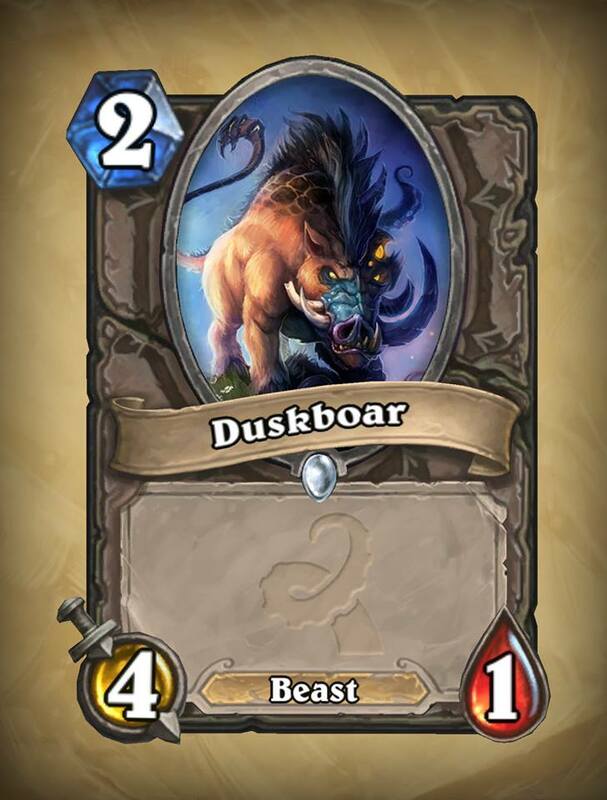 The Duskboar is like a variant of the Stonetusk Boar, costing 1 extra mana and giving up charge in exchange for 3 extra Attack. 5 points of stats for a 2-mana minion is decent, but the way these are distributed makes it exceptionally fragile, and plenty of 2-mana minions have not just 5 points of stats but other abilities besides. For this card to work you need immediate buffs, Steward of Darkshire, or Tundra Rhino. 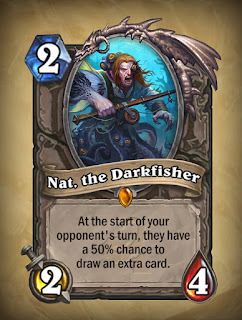 Nat, the Darkfisher is a, shall we say, unusual variant on Nat Pagle, an iconic angler from World of Warcraft, and formerly a critical questgiver for players seeking to hone their craft in the fishing profession. His Classic set Hearthstone card has a fishing-related effect, in the sense that you had a chance of "catching" a card draw each turn. In Whispers of the Old Gods he's taken a darker turn, as Nat, the Darkfisher. Nat, the Darkfisher has two obvious differences compared to Classic set Nat Pagle: he has 2 Attack (instead of 0), and, if you are the person who has played him, he draws cards for your opponent instead of for you. While a 2/4 statline helps him contest the board, the triggered effect is a doozy. Classic Set Nat doesn't see much play because he can't affect the board with 0 Attack, and isn't a reliable source of card draw. 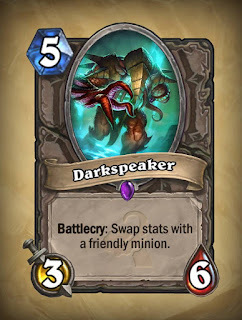 Darkfisher Nat might have two niches in which he can thrive: mill decks, where you want your opponent to draw cards in order to burn through their deck, and fatigue decks, where you want your opponent to draw cards to get closer to fatigue. 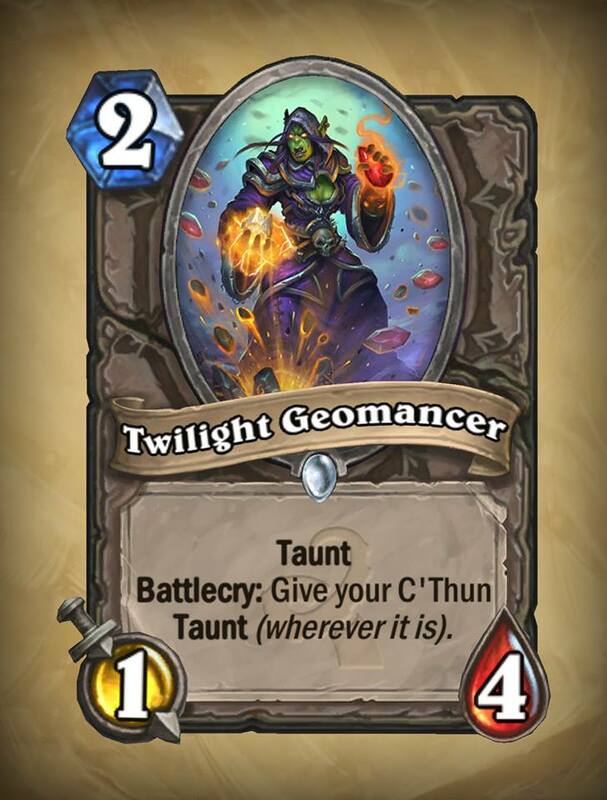 The Twilight Geomancer is a cheap Taunt minion that can help control Board against aggro, although not as well as the Wyrmrest Agent. On the plus side, you don't lose out on its Taunt or stats, unlike the Wyrmrest Agent if you don't have a Dragon card in hand. 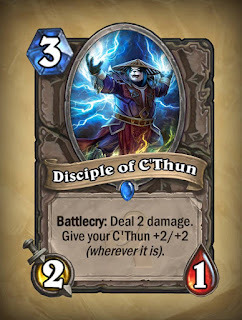 It also buffs C'Thun, although why you'd want C'Thun to have Taunt is a bit of a mystery - if only because you're hoping to close the game out with C'Thun, not stall. 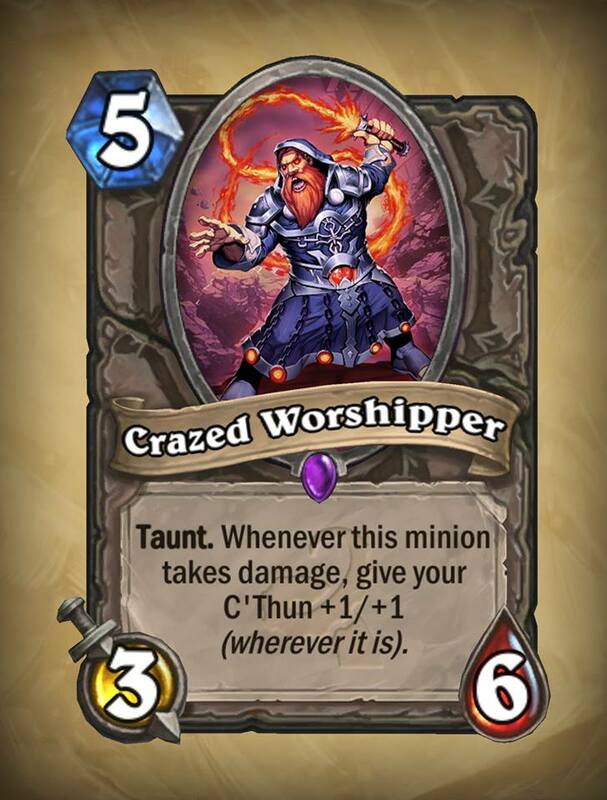 5 points of stats plus Taunt for 2 mana is decent value (by way of comparison, Annoy-o-Tron has 3 points of stats, Taunt, and Divine Shield for 2 mana), so I guess you get the C'Thun buff for free. 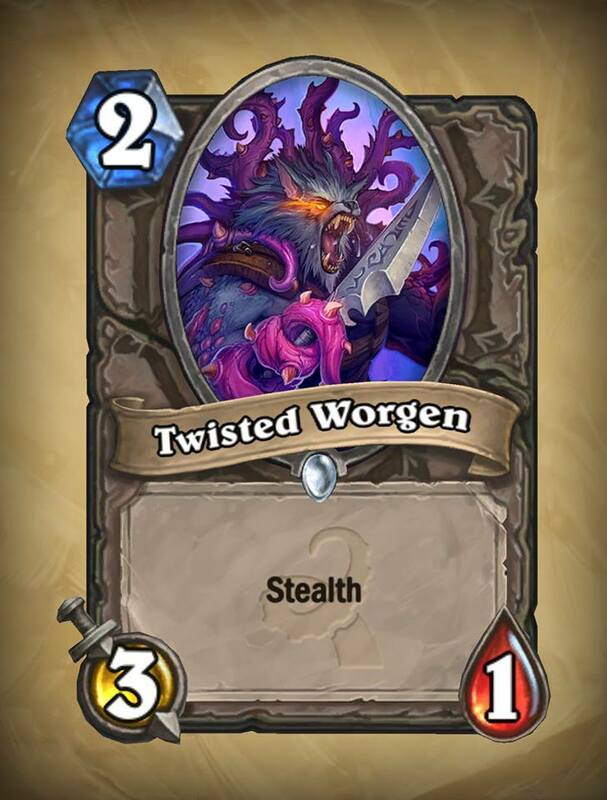 The Twisted Worgen is a slightly more powerful Worgen Infiltrator - you spend 1 more mana to get an additional Attack (3/1 instead of 2/1 stats). 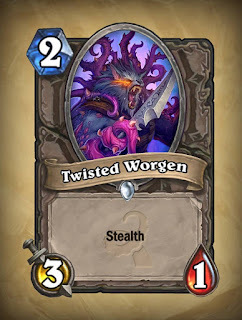 Stealth gives it some protection, but early area of effect spells and random-target effects clear it all too easily, and while it can trade up if it gets a chance, it's vulnerable to tokens or pings once it comes out of Stealth. 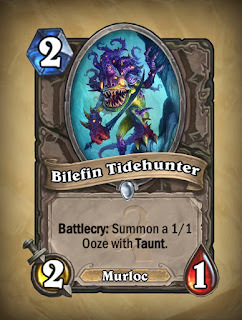 The Murloc Tidehunter is a Poor card; not much reason why the Bilefin Tidehunter isn't, either. Only the synergy with Knife Juggler and board-wide buffs keeps it from being Terrible. 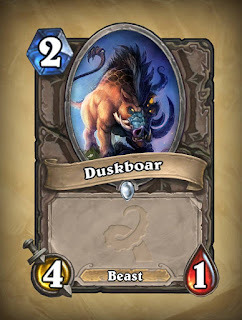 Magma Rager-level fragility plus dependence on other cards for functionality makes Duskboar, in my view, a Terrible pick. The Darkfisher's drawback (har!) is too great for his statline to be of any use. The only reason Nat isn't the first card I've given a Millhouse Manastorm rating is that he has the niche uses I've mentioned above. 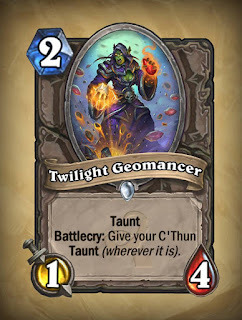 Twilight Geomancer might fit in to some C'Thun decks if you need to keep early aggro at bay, but there are probably better 2-drops you can play, especially in a C'thun deck. Twisted Worgen is just too fragile to be particularly useful for a 2-mana minion. Its Stealth makes it just good enough not to be Terrible. Here are the remaining cards that cost 3 mana in the expansion. The naming is so clever. for popular religious children's books. It requires peer pressure to be assertive. Someone else has to go first. 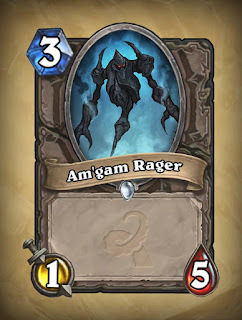 The Am'gam Rager is an inversion of the Magma Rager (notice the inverted name, plus obligatory eldritch apostrophe). A 1/5 for 3 mana is pretty bad stats considering it has no other effect. It works with a Hobgoblin deck and it can't be pinged like Magma Rager can. The Disciple of C'Thun has a terrible statline for a 3-mana minion. This is, it must be said, typical for minions that deal targeted damage on a battlecry such as Ironforge Rifleman or Stormpike Commando. Disciple of C'Thun has the mana cost of Ironforge Rifleman and gives up 1 Health in exchange for doing an extra damage on its battlecry and buffing C'Thun. So it ends up looking good compared to other cards with the same effect. Its pingable statline, though, and abundance of other C'Thun-buffing cards, make it a poor choice overall. 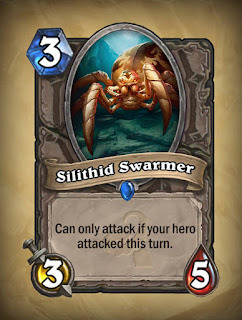 The Silithid Swarmer is a creature with a solid statline and a really crippling trait. You're basically playing a Spider Tank with an extra Health, only the Tank can't attack much of the time. I can't see that the extra Health is worth it. 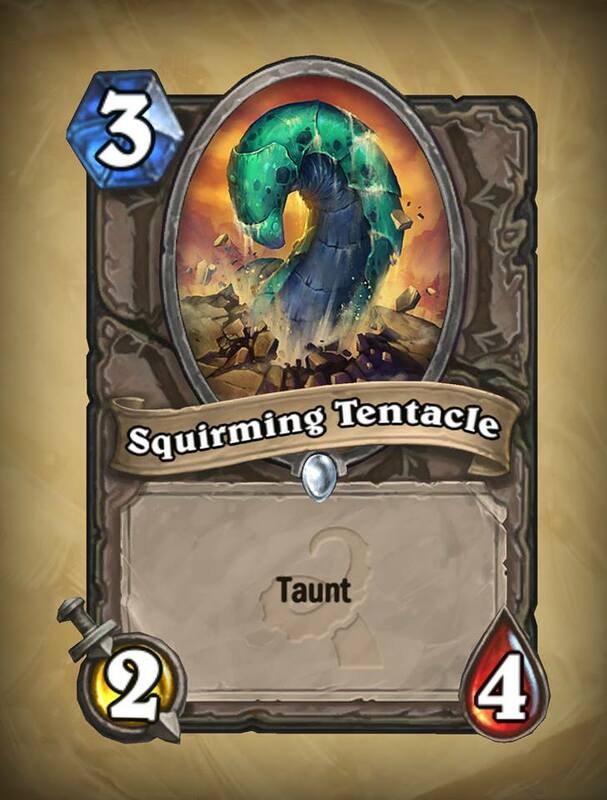 Lastly, the Squirming Tentacle is another minion comparable to Wyrmrest Agent. In effect, the Tentacle is a Wyrmrest Agent where you pay an extra mana to be guaranteed the 2 Attack and Taunt. It trades well with most 1 and 2 mana minions, as it will probably go 2-for-1 in the absence of a Silence or removal effect or an enemy buff. In Constructed, where early removal (Consecrate, Imp-losion in Wild, and others) can put paid to it easily enough, it isn't likely to be very useful. In Arena, it's still not great but at least it will probably do its job. 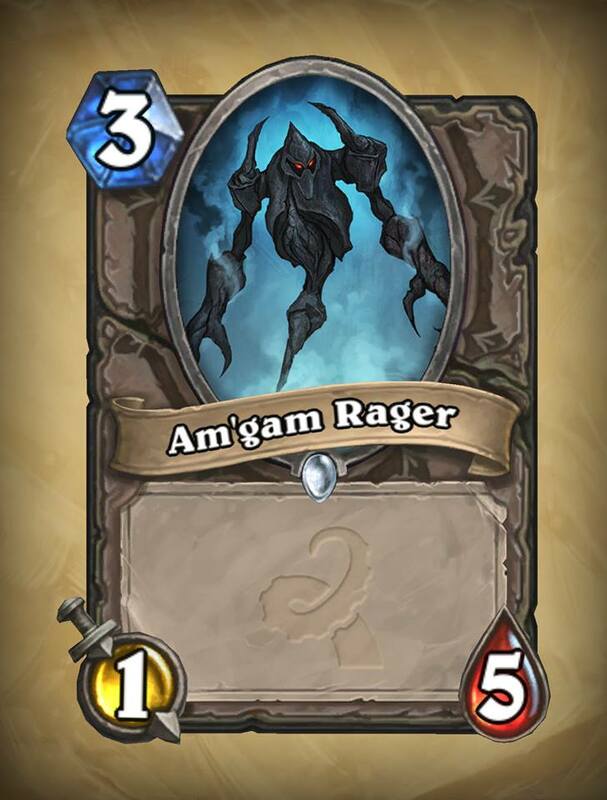 Nothing to see here with Am'gam Rager. You could do worse than Disciple of C'Thun. Not much worse, I'll grant you, but there's always Magma Rager. 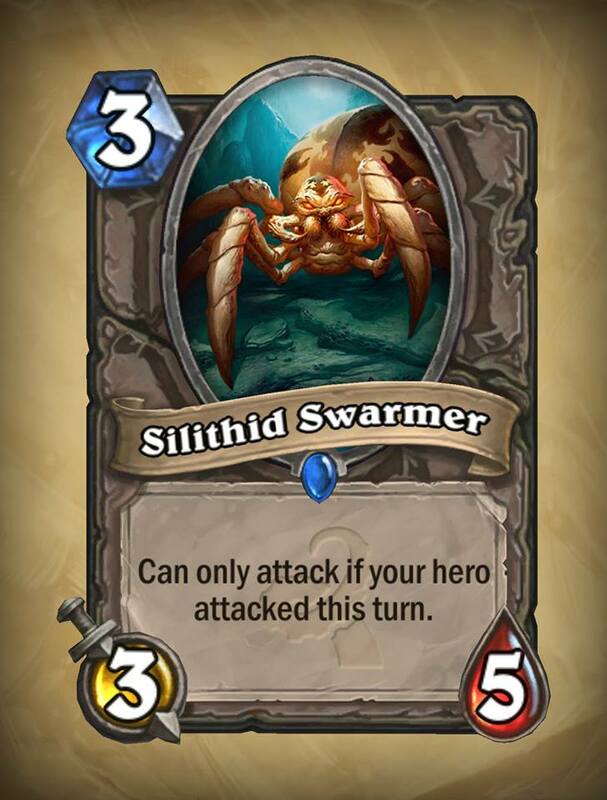 Silithid Swarmer helps keep the bulk of neutral 3 drops looking baaaaad. 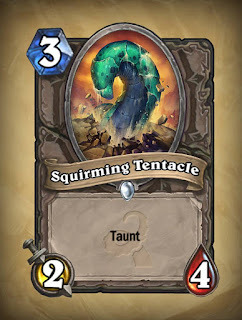 The Squirming Tentacle has too much superior competition in the 3-mana spot. Here are the remaining cards that cost 4 mana in the expansion. Enough with the rotten fruit! not in this pirate's day planner. Where's the horn and wings? Just try to take the candle now. It's something of a night owl. the ground, am I right? 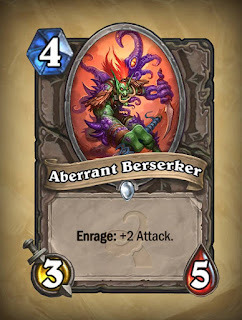 The Aberrant Berserker is a larger, more tentacularly-endowed Amani Berserker. Instead of a 2/3 minion with an Enrage effect boosting them to 5 Attack, for 2 mana, you get a 3/5 minion with a +2 Attack when damaged for 4 mana. It's rather like Sen'jin Shieldmasta, only with an Enrage effect instead of Taunt. Both Berserkers get 5 Attack when enraged. You're basically paying the extra mana for additional durability. The question is - is it enough durability? Also, healing or changes to base Health can nullify Enrage effects. 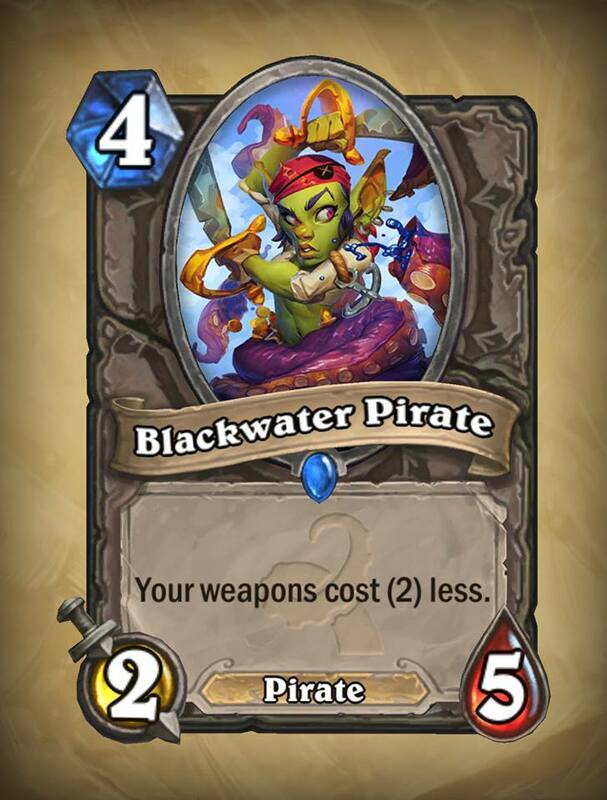 The Blackwater Pirate is an interesting Pirate Card, granting a discount on weapons. With a 2/5 body at 4 mana cost, though, it's not clear that the mana discount is worth the poor statline, although getting a free, say, Fiery War Axe early on could be a decent tempo swing if it helps secure the board. 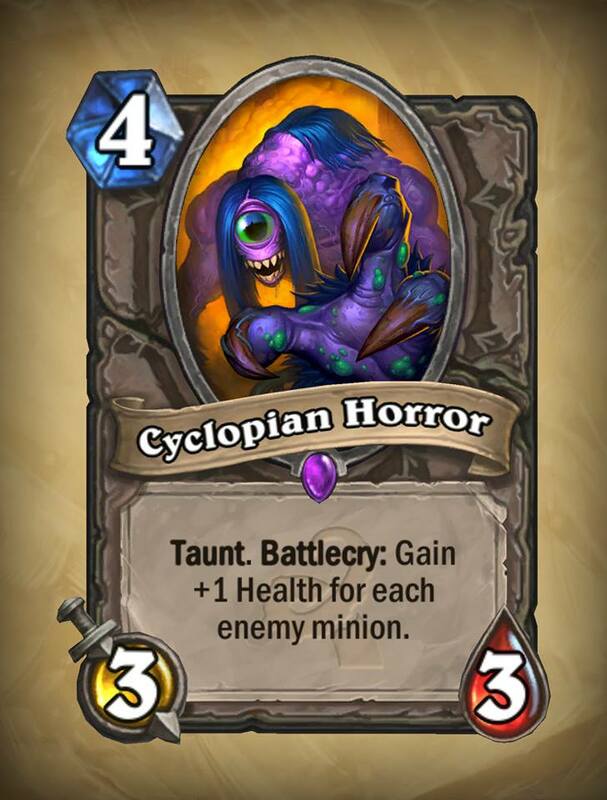 The Cyclopian Horror - I don't usually mind American spelling of words, but in this specific case it grates not to see Cyclopean - is a minion that works against decks that flood the board. Because you're usuallly in deep trouble if you're getting good value out of its battlecry when playing it on curve, you're probably going to want to play it a bit later and follow up with mass removal. In order to be a good play, you need to have at least two enemy minions on the board, so that the Horror ends up being a Shieldmasta. The Evolved Kobold (insofar as becoming infused with eldritch power and becoming a tentacled monstrosity counts as "evolved") is the Kobold Geomancer with more tentacles (and more Spell Damage). 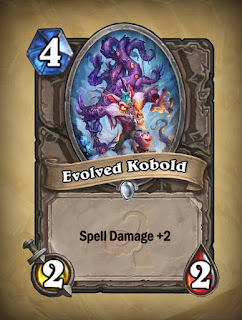 The Evolved Kobold has the same 2/2 statline as the Geomancer, but one extra Spell Damage, for 2 more mana. Spell Damage +2 is nice, but is it nice enough to have a 2/2 body for 4 mana? The Midnight Drake is the inversion of the Twilight Drake. 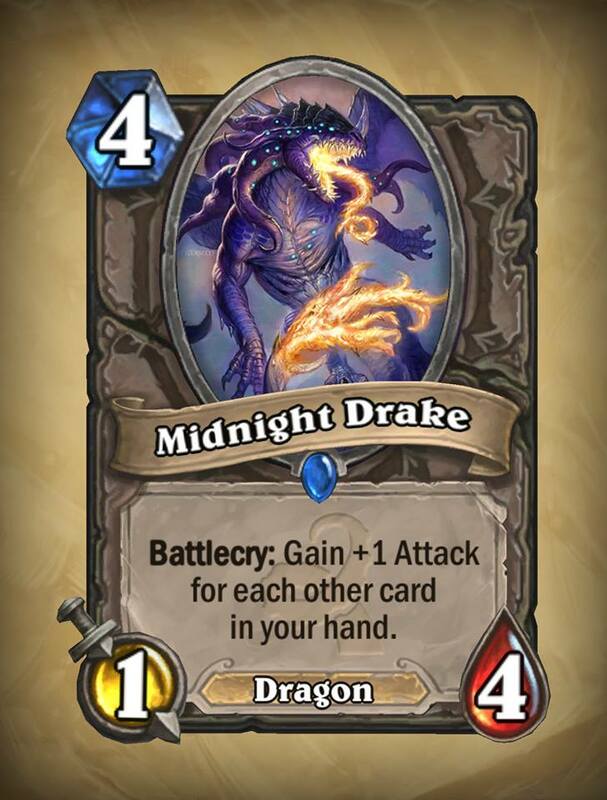 Where the Classic card is 4/1 and gets additional Health based on the size of your hand, the Midnight Drake is a 1/4 that gets additional Attack based on the size of your hand. The deck that uses Twilight Drake the most, Handlock (so named because it builds its hand up early, then plays things like Twilight Drake and Mountain Giant for early board control), won't switch to this, because Twilight Drake is better at controlling the board (because more durable). It might be an option for a dragon-themed deck: as long as you can play it when you have 5 (or more) cards in hand after it arrives on the board, you'll get your mana's worth in value out of it. 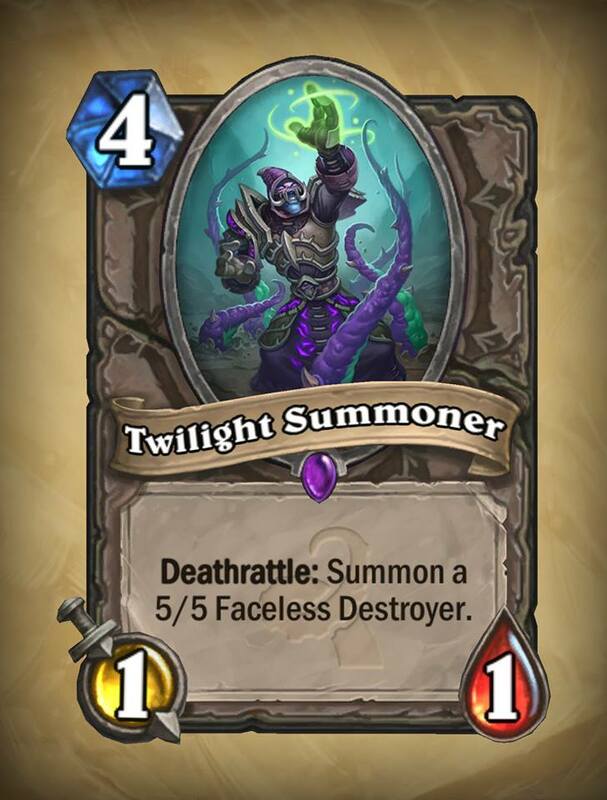 And at 4 Health it might be durable even if Silenced, able to clear tokens at least, where a Silence on a Twilight Drake was a death sentence. The Twilight Summoner is a curious 4-mana card. 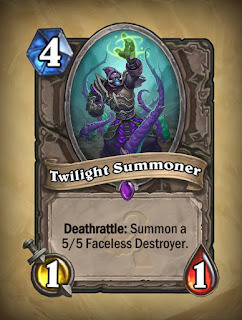 Its statline is terrible (1/1), but it has a great deathrattle, bringing a 5/5 body onto the board. You're basically getting 6/6 in stats for 4 mana, which is good value. 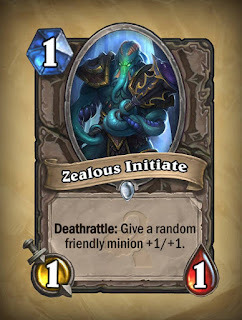 All the same, it's very low impact the turn you play it - playing it on curve can probably considered a very bad play. Apart from Grommash Hellscream, few Enrage minions see regular play. 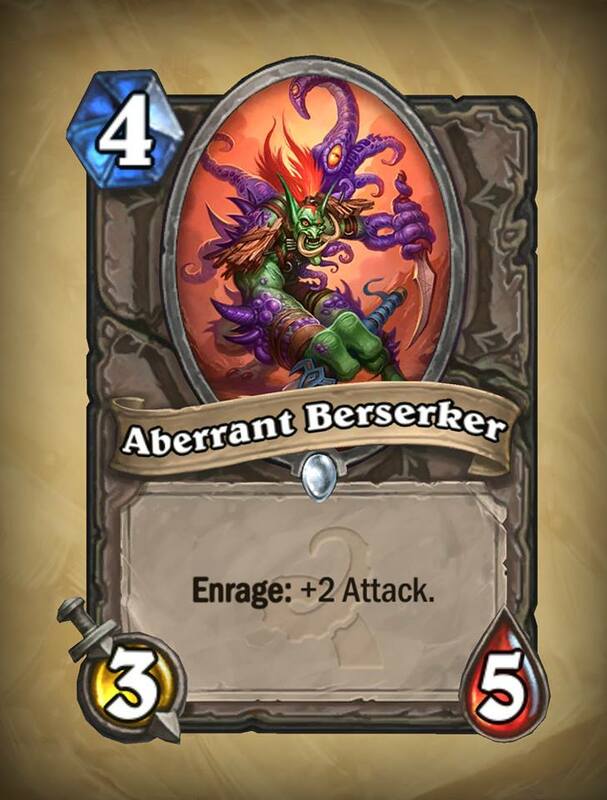 Some warriors can run a combo with Amani Berserker as a finishing blow, but that's about it. I don't see Aberrant Berserker bucking that trend. 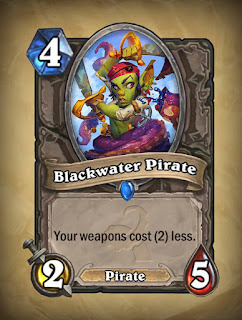 Most Pirates just aren't very good, and in my opinion Blackwter Pirate isn't either. The 4 mana slot is just too crowded with far better choices for minions in most decks. 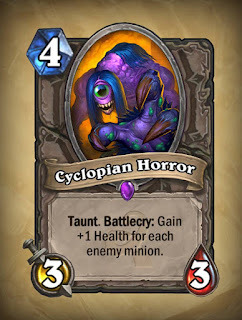 The Cyclopian Horror is good if you can play it for high value and then clear the opposing board, and it's lousy if you either can't, or if your opponent can clear it (or Silence it) straight away. As such, I'm not confident it will fit in the 4-mana slot that well. 4 mana cost and a 2/2 body make the Evolved Kobold too expensive and fragile for its Spell Damage to be worthwhile. 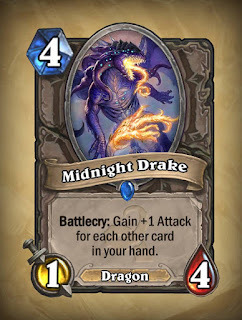 I'm not convinced the Midnight Drake is all that good a card, but it seems pretty decent. Expect to see it every so often. The Twilight Summoner is saved from Terrible status only because of the body it leaves behind. Here are the remaining cards that cost 5 mana in the expansion. Rock on, little robot. RIGHTEOUS!!! 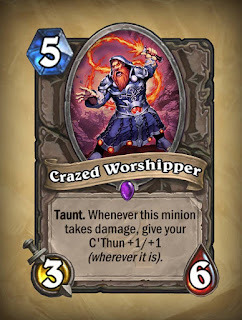 The Crazed Worshipper is another C'Thun buffing minion. For 5 mana you get a 3/6 minion (decent if underwhelming stats for the mana cost) with Taunt that buffs C'Thun whenever it takes damage. If you play it, and your opponent doesn't have the means to deal with it, except to trade in a bunch of tokens (or spells or effects that ping), it could be great. All in all, though, it strikes me as a "win more" card. It helps you when things are already going well; it won't turn things around much when they aren't. If you're contesting the board it would be a good on curve play; if you're behind on board it probably won't help. The Darkspeaker is a curious sort of minion. It's another 3/6 body for 5 mana, but it has the special effect of swapping stats with another friendly minion on the board. It's an interesting effect, to be sure; you could buff the Health of one of your existing minions to keep it around for longer - unless I am mistaken, the effect is such that it couldn't be silenced. However, it obviously is of no use if you play it onto an empty board, you wouldn't want to play it on a minion with better stats, and the Darkspeaker itself would probably come out the worse for wear in any exchange you'd care to make. The Psych-o-Tron is the heavy metal Annoy-o-Tron, complete with guitar on which it plays what are surely some deliciously hot licks. A 3/4 body for 5 mana isn't very good, but it does have Taunt and Divine Shield, making it, in effect, a 3/5 body at minimum - at best, it can be a 3/4+X body, where X is the amount of damage your opponent spends breaking the Divine Shield. I'm not particularly enthused by the Crazed Worshipper. Darkspeaker's ability is just too gimmicky to be effective. While Annoy-o-Tron was cheap enough, and could be played early enough, to have decent value for its statline and abilities, and could stymie early aggro to some extent, Psych-o-Tron does not possess those qualities. 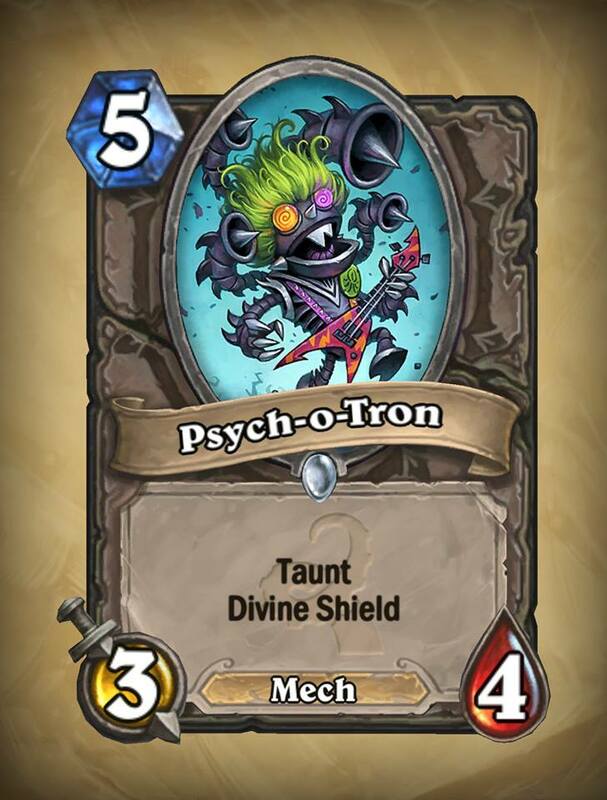 Annoy-o-Tron was already not a particularly good card. On the other hand, Psych-o-Tron makes a great backup musician for Elite Tauren Chieftain. Here are the remaining cards that cost 6 mana in the expansion. How can you tell it's corrupted? 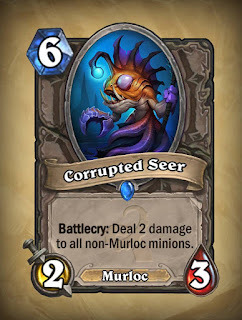 The Corrupted Seer is, by far, the highest mana-cost Murloc in the game. It's a 2/3 body for 6 mana, which is very low value. It has a strong battlecry, dealing 2 damage to all non-Murloc minions. It's very strong against aggressive decks which aren't Murloc decks. Against midrange or control decks, it might work out if it enables you to secure the board without spending too much of your own. It's pretty bad in Murloc deck vs. Murloc deck matches. The advantage it has over board-clearing spells is that it leaves a minion on the board if you play it when your board is otherwise empty. 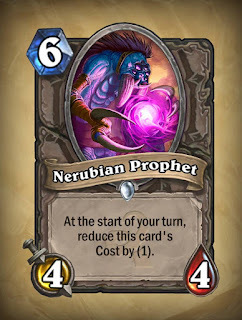 The Nerubian Prophet is another pretty poor minion for 6 mana (having a 4/4 body), but it comes with the potential of ultimately costing less mana. 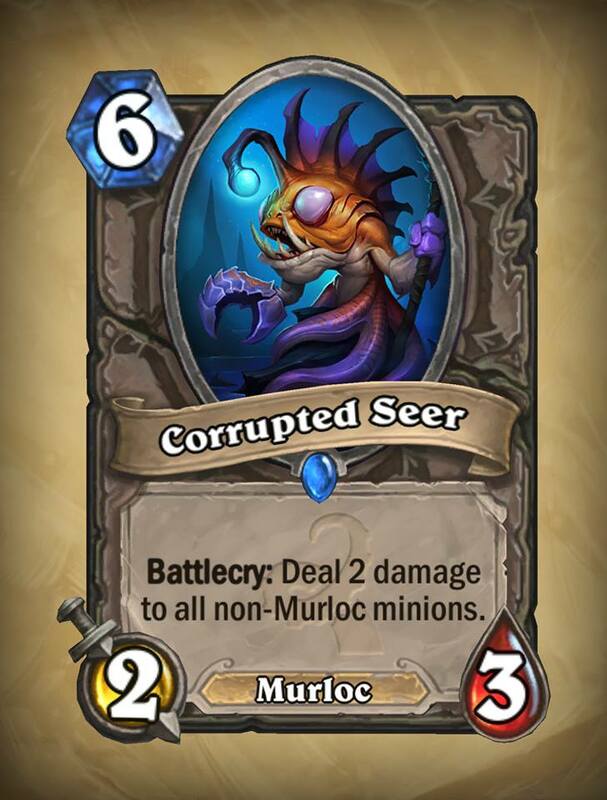 For example, if you have this in your hand after the Mulligan, you'll be able to play it on curve on turn 3. A 4/4 body for 3 mana is pretty good. Another possibility for rogues is that they can hold this in hand until it costs 1 or even 0 mana, then play it as an activator for various combo cards. The Corrupted Seer's statline is just too small for a 6-mana minion, even taking its battlecry into effect. It might see some niche plays though, as a clutch board clear. Although it's a decent body once it gets discounted, I just can't see wanting to have the Nerubian Prophet take up a spot in your deck. If you draw it from a card with the Discover mechanic, it would probably be fine. It might have a niche use in some rogue decks. Here are the remaining cards that cost 7 mana in the expansion. good at creeping around in bogs. they're not all C'Thun decks. 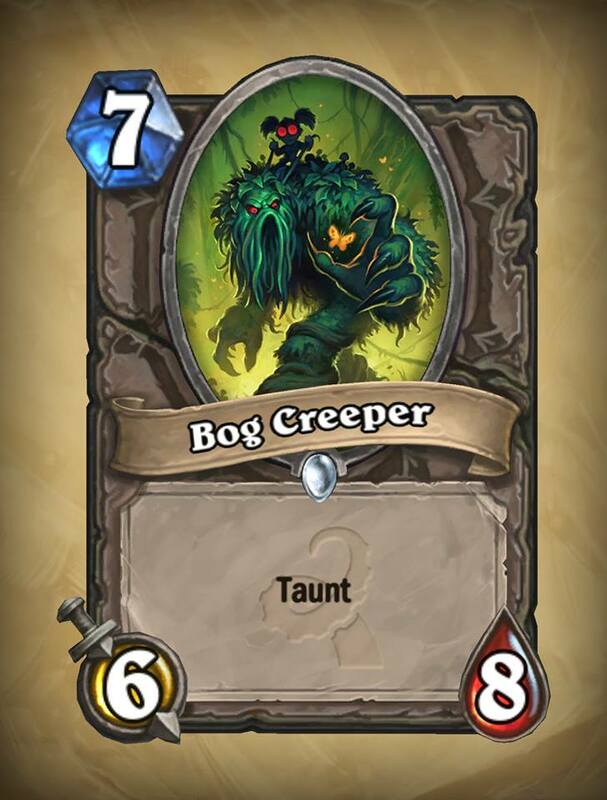 The Bog Creeper is the bigger version of the Fen Creeper. 2 more mana, in effect, gets you 3 more Attack. It's identical, stat-wise, to the Boulderfist Ogre, which is a solid if unexciting minion (and usually a good "finisher" for basic decks). 1 more mana, in effect, gets you Taunt. It's also comparable to the Lord of the Arena. 1 more mana, in effect, gets you 3 extra Health. At 6 Attack, it's immune to Big Game Hunter. The Grotesque Dragonhawk is a much, much bigger version of the Young Dragonhawk. You're paying 6 extra mana for the bigger body. If the Grotesque Dragonhaw can survive the turn its played - or if you can give it Charge - it can deal lots of damage - 10 each turn. With Attack buffs it could end a game very quickly. A 5/5 body for 7 mana, though, is very fragile. The only regularly-played 7 mana minion that was 5/5 was the Ancient of Lore, and it's not clear how much play it will see now it's been nerfed. The Twin Emperors were the ostensible rulers of the Qiraji (after C'Thun, of course). They don't have a lot of support in World of Warcraft lore, mainly being relegated to being key bosses in the same dungeon in which players encountered C'Thun. 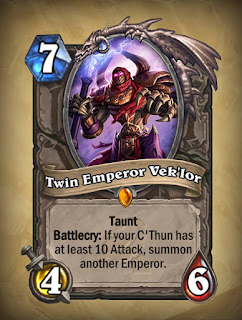 Twin Emperor Vek'lor is a 4/6 Taunt minion for 7 mana, which is pretty bad. 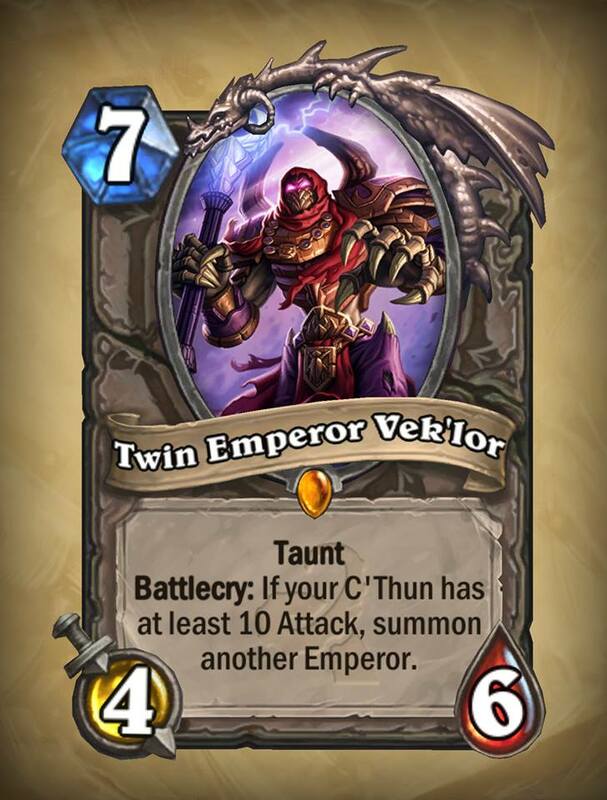 If, however, you're playing a C'Thun deck, and C'Thun has been sufficiently buffed, he summons his twin, Vek'linash, an (unsurprisingly) identical 4/6 Taunt minion. By way of comparison, Druid of the Claw is (depending on its player's choice when played) a 4/6 Taunt for 5 mana, so getting two Druids of the Claw for 7 mana is, it must be said, pretty good value. 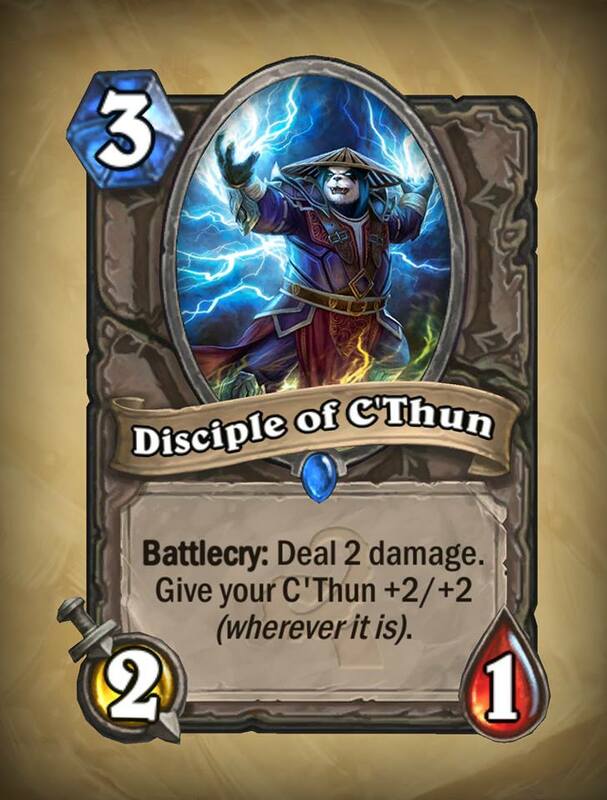 With the number of C'Thun-buffing cards in this expansion, it also seems pretty unlikely that you'll reach the point where you're playing Vek'lor without him also summoning his brother. 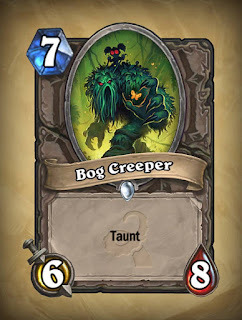 Newer players or free-to-play players with limited access to stronger cards will probably find the Bog Creeper to be a decent addition. Long-time players, or players who are willing to open their wallets for cards, will have better cards to fill the top end of their mana curves. Few Windfury minions see much play (the only one that did regularly, the Whirling Zap-o-matic, is getting rotated out of Standard format), because of their stats relative to their mana cost. 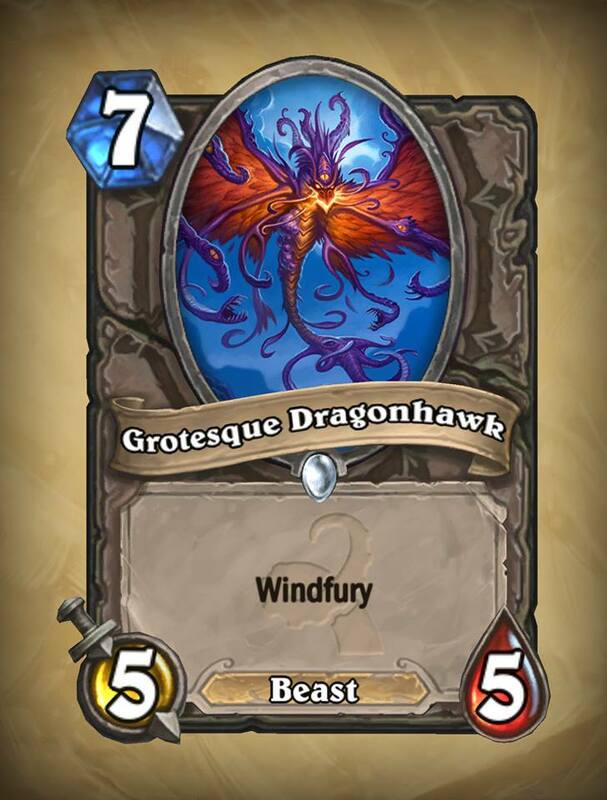 I don't see the Grotesque Dragonhawk seeing much play either, except perhaps as a surprise source of burst damage in, say, a Charge-themed Warrior deck, courtesy of the spell Charge. 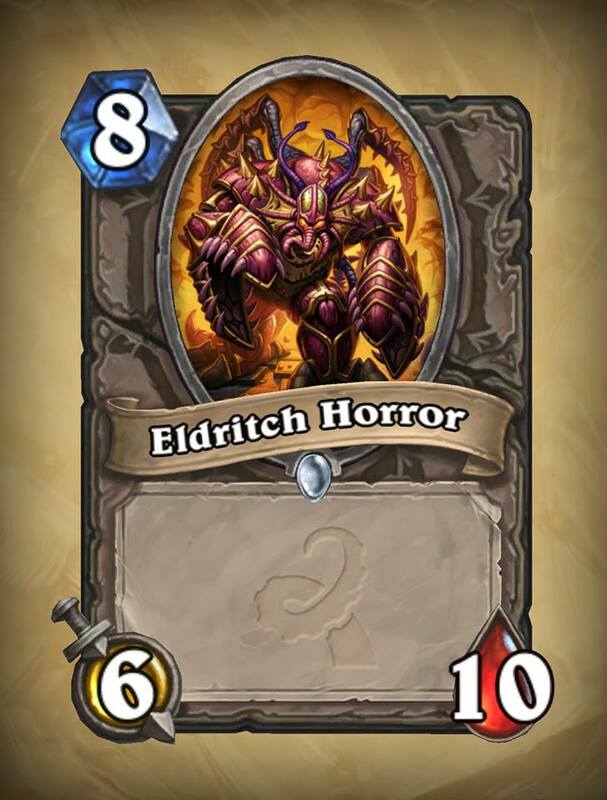 8/12 in stats for 7 mana is pretty good value. The only downside is that the Twin Emperors don't do much when you play them, although in a C'Thun deck with a really buffed C'Thun, maybe stall a turn or two and get in a hit or two is all you need from them. Here are the rest of the cards in the expansion, all costing 8 or more mana. 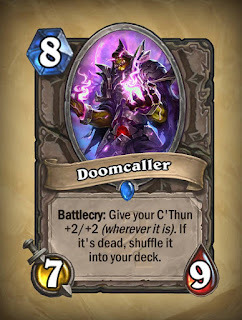 At 7/9 for 8 mana, the Doomcaller has comparable stats to other 8-drops with special effects. His special effects are to buff C'Thun, and, if your C'Thun has been destroyed, to shuffle it back into your deck. Having 7 Attack, he, along with the Skeram Cultist could very well bait out your opponent's removal, out of necessity, before C'Thun drops. 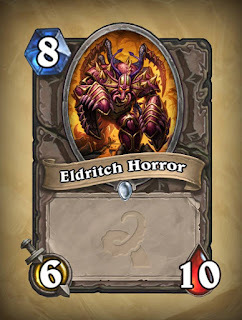 The Eldritch Horror is an 6/10 for 8 mana with no other abilities. If you're going to run an 8-mana minion, there are, it must be said, far superior choices. Many less costly minions are also better, having some special board-affecting ability. About its only positive is that it's immune to Big Game Hunter. The Faceless Behemoth is the epitome of a plain minion. (Since vanilla is actually an interesting and exciting flavour, I dislike the association between vanilla and plainness.) It's a 10-mana War Golem. 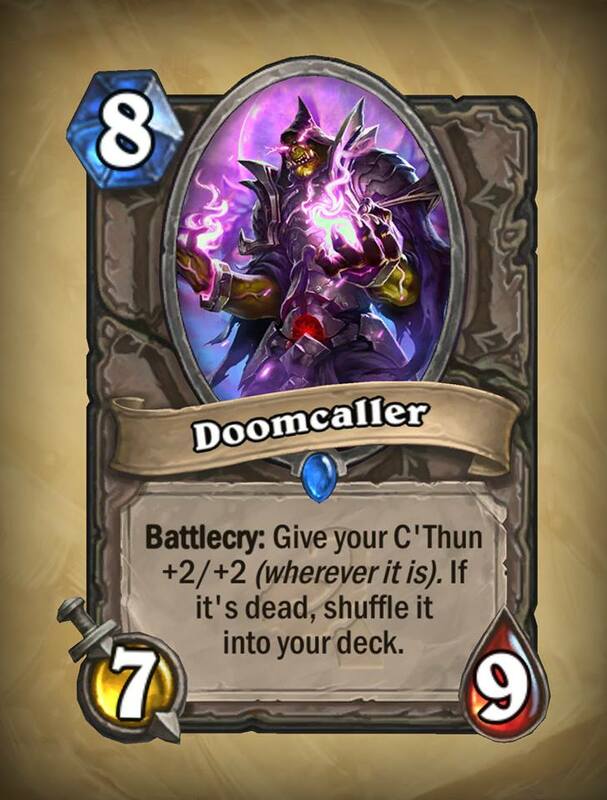 The Doomcaller will probably be a one-of in some C'Thun decks, because why inflict the horror of C'Thun on your opponent once when you can do it twice? Rogue decks will probably use Shadowstep instead. The Eldritch Horror might suffice if you have absolutely nothing better to play. Players on a budget might consider a Faceless Behemoth to round off the top end of their deck. But they'll likely have better choices already. There you have it, just in time for before the launch of Whispers of the Old Gods! Every last card reviewed. If I've missed any, I'm too tired of reviewing cards to go back. About the only thing I might do is offer a "consolidated" review post, where I look at how many cards I gave each rating, and note any special highlights or disappointments. In a few months, when the meta has adjusted, I may go back and see how my review turned out in terms of accuracy, whether I over- or under-rated anything.